You’ve decided that you’re ready to start learning the piano online. Now, one of the most difficult parts of the process is taking time to sit down and practice. Often when we first begin to learn piano it’s exciting to practice because the process is new and we can measure progress so easily. 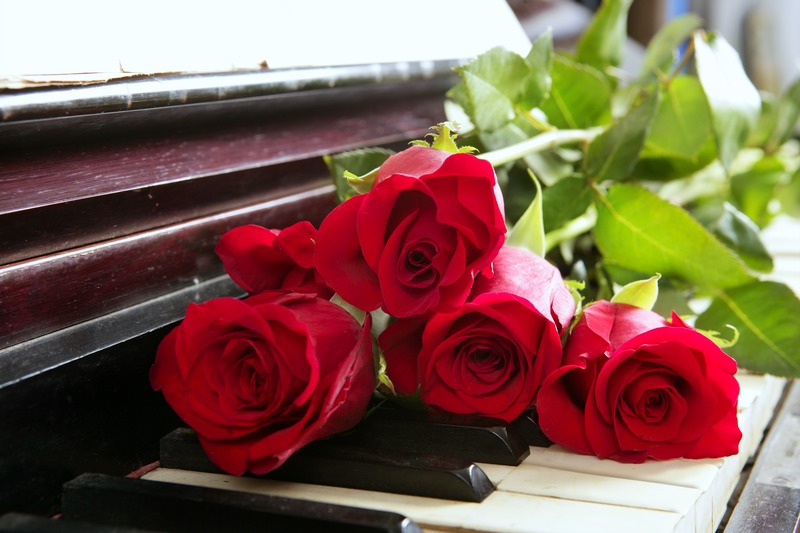 But as playing the piano becomes more difficult and requires more concentrated practicing, many piano learners become discouraged and avoid practicing. You may find yourself more likely to stick with your goals if the space in which you practice is set up to be as productive and encouraging as possible. Here are some tips on how to set up that ideal practicing space. Once you’re dedicated to practicing in the same space every week, be sure to choose an area that feels spacious and comfortable. The corner of your office may seem like a good place for the piano, but consider making your piano more of a centerpiece item rather than hiding it. When you sit at the piano to practice, you want to feel completely at home and comfortable, not cramped. Have you ever sat in a tiny space for way too long? Doing so may cause you to become irritable and that won’t help the mental relationship you should develop with practicing. Think about it the way you think about an office space or a desk. If you had to sit at a computer for hours, would you prefer to sit in a comfortable chair at a large desk or in a lecture hall style desk, where the writing space is a foldable square of wood? Most of us prefer to be able to stretch out and feel relaxed while we work, and the same goes for the work you do when you practice piano. Another important factor to consider in choosing your designated practice space is the noise and distraction factor. Ideally, you want to set up your practice space in a room that you can close off from the rest of the house. If you have anyone else living with you, such as roommates, kids, or pets, you want to be able to close the door and practice without hearing them. It’s a good idea to tell anyone you’re living with before you go to practice a kind but firm reminder, like, “I am going to practice piano now, please don’t disturb me for the next twenty minutes unless it is important”. Although this may seem harsh at first, you’re setting healthy boundaries that help you focus on your instrument. It’s a little more difficult to have that conversation with a dog or a cat, and it’s therefore easier if you simply close the door. If you do not have the luxury of putting the piano in a space which you can isolate, you could buy a foldable screen so you can section off the area. The idea is that when you practice piano, you get in the headspace that practicing is your only responsibility and priority for however long you decide to devote to that practice session. As you select a space for the piano in your home, a final factor you might consider is acoustics. If you’re a new musician, you might not be sure how to test the acoustics of your home. We recommend you walk around with a speaker and play music in different areas of your home to see what music sounds like in different spaces before placing your piano. The goal is to place the piano somewhere with very little to no echo. Additionally, you may want to consider where the placement of the piano will be the least disturbing to your neighbors. Once you designate one definite spot to be your piano-learning area, be sure to keep it neat and tidy. Don’t lay your coat on the piano bench when you get home from work—it may seem like a temporary moment of relaxation, but it can actually be harmful for your practice. Your piano is not a closet or a placeholder for mugs. It’s a fine and delicate instrument that deserves your full respect. When you show that you value your piano and practice space by keeping them clean, they become more inviting for you to sit and practice in. If your space is a mess, your first thought when you see will be is “ugh, I have to clean that” and it becomes another household chore instead of a friendly reminder of “oh, I should practice this afternoon”. Above all else, do not let your piano get dusty. A dusty piano is a piece of unused furniture instead of a thriving musical instrument. Decorate your designated practice space with photos of artists you admire and aspire to. When you are frustrated and practicing something difficult, it can be helpful to look up and see the face of a famous musician who you know worked very hard to get to where they are. Even if you don’t want to be a famous musician yourself, relating to the hard work ethic of these idols can be helpful.